In today's competitive business environment, it is more important than ever to keep your employees motivated and your customers coming back for more. Cloud 9 Living offers unique corporate gifts for organizations looking to offer memorable rewards, and experience gifts are ideal as individuals continue to place more value on having new life experiences. Make a lasting mark on clients and employees with corporate gifts that keep on giving. When it comes to optimizing the impact of a corporate gift, there's no time like the present to do it right. 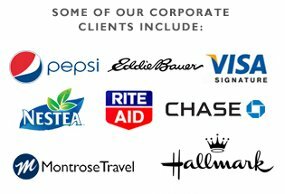 Whether you're thanking team members for a job well done, recognizing clients for continued business, bidding a fond farewell to a valuable employee, or even awarding lucky contest winners — Cloud 9 Living offers a turn-key solution to put an exciting and personal touch on your company's gifting and rewards initiatives. When employees know they are appreciated for their contributions, it shows — in terms of employee morale and in your business' bottom line. That's why Cloud 9 Living experience gifts make the perfect addition to any employee recognition program. And if business is booming, then who better to thank than your loyal customers? Express your gratitude for their continued support with Cloud 9 Living's collection of corporate gifts that are second to none. Our version of customer appreciation goes above and beyond the typical "thank you" and will last long after your recipient's gift is opened! Give an experience and treat your customer to a new lifelong memory - a memory they'll always associate with you. Now that's powerful! Time for a dedicated employee to retire? Send someone off in well-deserved style with retirement gift ideas that will be remembered for years to come! Show your company's appreciation for professional achievements and service with unique corporate gifts that exude gratitude, and motivate the lucky recipient to make the very most of the new chapter ahead. Or maybe you're running a customer promotion to launch a new product and drive customer engagement? Cloud 9 Living's unforgettable experiences are perfect for sweepstakes prizes and incentives for consumer promotions, product launch campaigns, corporate conferences, trade shows, stakeholder summits, industry events, and more. Explore your gifting options and give an experience today! 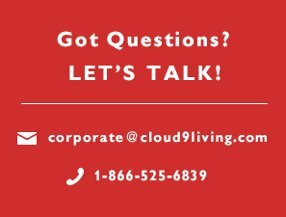 Call 866-525-6839 to speak directly with a Cloud 9 Living representative or email corporate@cloud9living.com for assistance. Celebrate retirement with corporate gifts that will give them incredible tales to tell in the next chapter of life. Retirement is a commendable milestone. 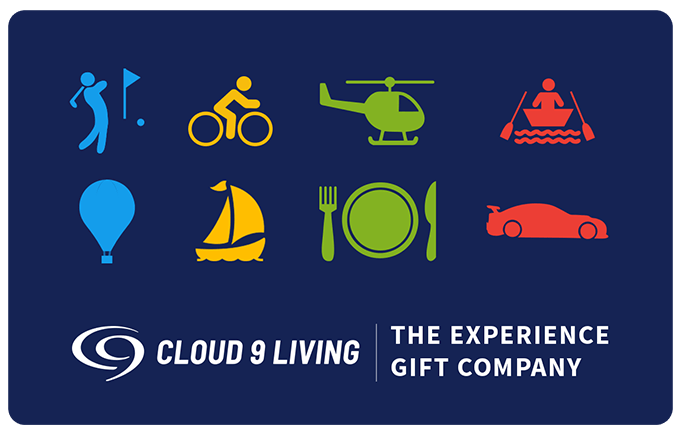 Honor a dedicated employee's years of service and support in a remarkable way with Cloud 9 Living retirement gifts that give the ultimate send-off! Whether he or she is looking forward to the low-key lifestyle, or is focused on making bucket list wishes come true across a new abundance of spare time — Cloud 9 Living has the resources to get retirement started right. So kick-off a valued employee's post-career life with corporate gifts that are just as unique and unforgettable as your retiree! Is some well-deserved R-&-R in order? Invite your retiree to kick back and relax with Cloud 9 Living experience gifts like delectable food tours, private vineyard outings, exclusive golf lessons with PGA Pros, serene spa days, timeless hot air balloon rides, scenic lunch and dinner cruises, and many more wonderful ways to unwind. Or maybe they're ready to go from office attire to adventure gear? Then be sure to check out action-packed corporate gifts like race car driving, hiking, ziplining, whale watching, kayaking and rafting, bike tours, flying lessons, and plenty of other exciting options that are not to be missed! And one of the best parts? Your lucky recipient will hardly have to lift a finger to make arrangements for the big day. Cloud 9 Living's exceptional Customer Service team is available Monday – Friday (9 AM – 5 PM, MST) to take calls, answer questions, and book any experience in a quick, easy manner. Simply call 866-525-6839 or email corporate@cloud9living.com for assistance. Fact: Giving meaningful corporate gifts successfully cultivates, sustains and maximizes employee engagement. Demonstrating appreciation for your employees is a pivotal key to business success. So how do you plan on recognizing the individuals and teams who are the invaluable building blocks of your company? Presenting corporate gifts that are significant, entertaining and sophisticated, Cloud 9 Living is the most reliable place to start and finish your search for unique employee recognition ideas. Employees who feel valued experience higher rates of satisfaction at the office, and are more motivated at work day in and day out. And the result isn't just a healthy, happy work environment; it's also more productive employees — which is wonderful news for the company's bottom line! So why not work some engaging, memorable experiences into your employee recognition program? Endorse some friendly competition among coworkers by implementing the most rewarding sales incentives your company has ever had. Nothing will get more deals closed, goals exceeded, emails sent, and calls made faster than corporate gifts that offer the chance to be a fighter pilot for a day, unwind at the spa, drive a race car, explore on a guided city tour, and much more! Maybe it's high time to acknowledge some of your company's greatest achievements. From the smallest and most significant victories, to the biggest and most record-setting successes — commend your employees for their commitment and contributions to the latest leg of the company's journey. And let them celebrate by choosing their own adventures with Cloud 9 Living Gift Certificates! Bring coworkers together with team building activities that provide challenge, recreation, and professional takeaways. Cultivate peer-to-peer collaboration, communication, and unparalleled company memories with experiences like ziplining, food tours, baja chases, snowmobiling, rock climbing, city-wide scavenger hunts, and several other unique outings that are great for groups! Thank your clients in the most impactful way with corporate gifts from Cloud 9 Living. Your clients are the lifeline of your business. Show your gratitude for their support and customer loyalty with unforgettable corporate gifts that not only get noticed, but will be remembered. When it comes to loyalty, clients are most inclined to continue work with partners that are invested in not only their business, but also their well-being. The solution to ensure you are meeting this expectation is simple: experience gifts. â€¢ Make lifelong memories — memories they will forever owe to you! So remember: when it comes to corporate gifts and customer loyalty, a timeless "thank you" yields remarkable results for years to come. The solution for creating winning customer promotions has arrived! Using a promotion as a platform to reach current and potential customers? Cloud 9 Living helps you guarantee that the promotional gifts you award are as big as the buzz you create! Your company's promotional efforts need to last long after a sweepstakes, trade show, conference, campaign launch, or other industry event has wrapped up. That said, there's no time like the present to make sure your promotion prizes give participants high-quality rewards that exceed their expectations and last a lifetime. Cloud 9 Living's vast array of sweepstakes prize ideas that do just that. And more! Experience gifts from Cloud 9 Living invite promotion participants to enjoy exclusive, once-in-a-lifetime opportunities that leave a lasting mark — like Ferrari racing, sailing aboard an America's Cup boat, Fighter Pilot for a Day missions, golfing at the nation's top resorts, floating through the clouds in a romantic hot air balloon ride, and beyond! For additional information and to shop for promotional gifts that perfectly fit your company's needs, contact Cloud 9 Living today at 866-525-6839 or corporate@cloud9living.com.